When you installed OneDrive local client tool, you can see there is a new OneDrive folder in our local system, however, not always we need it, so we might want to “Disable” the OneDrive folder in local system. Open your windows hidden icons on taskbar, and right click the OneDrive icon, First you’d better select “Open your OneDrive folder” to access your local OneDrive folder, because later you might want to your local OneDrive folder. Now select “Settings” menu item. 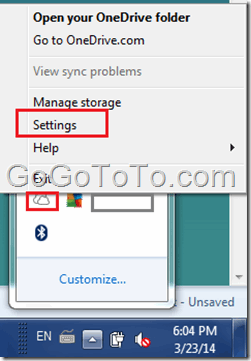 Click “Unlink OneDrive” button to disconnect remote OneDrive with your local system. Now you go to the local OneDrive folder which you have accessed to which we mentioned at the beginning. it is up to you if you want to delete local OneDrive folder. One more step: It is up to you, if you think you really don’t need OneDrive, go to control panel to uninstall Windows OneDrive client. then you can delete local OneDrive manually if you did not delete it successfully before. Microsoft OneDrive is Coming soon ? How to update MS.NET Classifieds Starter kit Template in VS2005? Microsoft OneDrive is Launching !